One of the first steps in making a temari is deciding what combination of colors you are going to use. #5 pearl cotton, the most common thread used to do the embroidery, comes in over 300 colors. Selecting just the right colors can be a challenge. While there are certainly no hard and fast rules to follow, you may find that using the theories or guidelines given in books on color theory can help you come up with some striking combinations. Many of these theories are based on a color wheel composed of 12 colors that was invented around 1731. 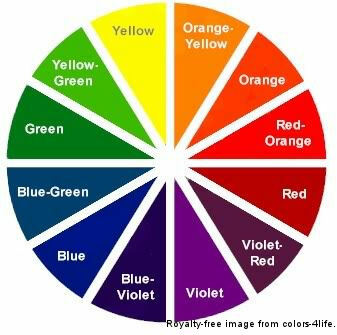 The wheel serves as a way to learn color relationships by organizing the colors in a circle so you can visualize how they relate to one another. Hundreds of books have been written on color theory and many are far more scientific that is necessary for our purpose of selecting temari colors. Color wheels are standard art tools; one is shown to the right, but it's helpful to purchase one (they come in various sizes). They are readily available at craft, art and fabric stores. To use a color wheel you need to know that the primary colors are red, blue and yellow. Green, orange and violet are secondary colors, obtained by mixing 2 primary colors together in equal amounts. Blue and red make violet; yellow and red make orange; yellow and blue make green. Mixing 2 secondary colors in equal amounts gives you the tertiary colors: yellow-orange, red-violet, blue-green, blue-violet, and yellow-green. The tertiary colors may also be referred to as intermediate colors. Hue is the term used to refer to these 12 pure colors. By combining these 12 colors in unequal amounts you come up with an endless variety of other colors. Other terms that are used to describe color are tint, tone, shade, value and saturation. When you add white to a color it is called a tint. Pink, for example is a tint of red. Gray added to a color gives you a tone. Mauve is a tone of red, since gray is added to red to achieve it. A shade results from black being added to a color. Adding black to green results in Forest green as a shade of green. Value refers to the lightness or darkness of a color in relationship to black and white. Burgundy is a darker value of red compared to pink. Saturation is the brightness or dullness of a color. The pure hues are the most intense and brightness. One way to diminish the saturation is to add a small amount of the color opposite it on the color wheel. Can't you just pick 3 or 4 colors that you like together? Sure you can, and that often results in some beautiful color combinations, but using the color wheel can open your eyes to all kinds of new combinations and may encourage you to use colors you would not try otherwise. The color wheel is also a great help when you know that a combination isn't exactly right, but may not know just what;s throwing it off. If you compare your color selections to ones from the color wheel, you most likely will be able to see the problem. Sometimes something as simple as replacing say, a red-violet with a blue-violet, can make a big difference. When planning the color scheme for your temari remember that it's not just the embroidery thread colors. Remember to consider the dodai mari wrap (unless you are working an all-over), as well as any metallic threads that are being planned. The easiest way to select colors for your temari may be to use only one color. One-color schemes are known as monochromatic. A red based monochromatic temari could have a white thread base and be embroidered in red, pale pink and black. By using a dark, medium and light color plus 1 or 2 neutrals (if desired), you can easily come up with many simple but effective combinations. The following information lists some of the standard color combinations used regularly by artists and craft persons. Keep in mind that "color" means all the shades, tones and tints of that color. If you think only in terms of bright colors some of the combinations may not appeal to you, but if you think peach instead of orange for example, you may find just the mix you're looking for. Try dividing up all your threads according to the 12 colors of the color wheel. If you have problems doing this you can find color wheels with many of the shades, tones and tints added. Then go through some of the following suggested combinations and try them out. Remember that neutrals can be added to any of the combinations without affecting the harmony. Neutrals include white, cream, gray, beige and black. 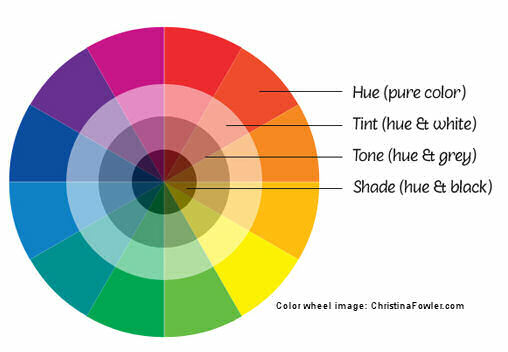 The following abbreviations apply to the color names listed on all standard color wheels, including the one illustrated above. Red= R, red-violet= RV, violet= V, Blue-violet= BV, Blue= B, Blue-green= BG, Green= G, Yellow-green= YG, Yellow= Y, Yellow-orange= YO Orange= O, Red-orange= RO. Other effective combinations using 2 colors can be found by looking at the color wheel and selecting colors that are separated by 1, 2, 3 or 4 colors. These are sometimes called spaced color harmonies and give you many possibilities. With R+G select one of these accents: Y or B or V or O. With RV and YG select one of these accents: BV or BG or RO or YO. With V and Y select one of these as an accent: O or G or R or B. With BV and YO select one of these as an accent: RV or BG or YG or RO. With B and O select one of these as the accent: G or V or Y or R.
With BG and RO select one of these as the accent: BV or YG or YO or RV. Split Complementary Colors offer more 3 color options: Choose a color and then add the color on either side of its complement. 1. OR+BG+BV 2. BG+R+O 3. G+RV+RO 4. R+YG+BG 5. RV+Y+G 6. YO+B+V 7. B+RO+YO 8. RO+G+B 9. YG+V+RV 10. Y+BV+RV 11. V+YO+YG 12. BV+O+Y. Another set is: pick 2 colors on the wheel that are separated by 2 colors and then skip 3 colors on the outer side of each. Use one of the 2 remaining colors as an accent color. This gives you 24 possibilities. The first 2 colors listed are the main colors. Select one of the other 2 colors as an accent. 1. RV+OR accented by BG or G. 2. YG+B accented by RO or R .
3. G+BV accented by O or RO. 4. BG+V accented by O or YO. There are four other combinations are possible by using the triads. Triads are 3 colors equally spaced on the color wheel. These combinations make striking, well-balanced temari balls. Since most temari balls are relatively small, 4 or more colors on a ball may be used less often than the 1, 2, or 3 color combinations, but some patterns do lend themselves to the use of more colors. One easy way to select 4 harmonious colors is to select 3 analogous colors (side by side) and add a color directly opposite one of them as an accent. This gives you 36 possibilities. The first 3 colors listed are the side by side colors. Select only one of the next 3 colors as an accent. The following 4-color possibilities are found by selecting 2 colors separated by a single color, then adding the 2 colors directly opposite them. It may look best to use one color as the main color and the other 3 colors in smaller amounts. 4. RV+YG+BV+YO 5. RV+YG+RO+BG 6. BV+YO+BG+RO. The next 4 color combinations are tetrads, found by using 4 colors equally spaced on the color wheel. There will be 2 colors between each of these. Twelve more options for the 4-color combinations can be found by selecting 3 alternate colors and using the color opposite the middle color as an accent. The last color below is the accent color. Twelve more combinations can be found by using the triads. They are 3 equally spaced colors on the color wheel. Then, as an accent, use one of their complements. 1. O+G+V accented by one of these B or R or Y. 2. YO+BG+RV accented by one of these BV or RO or YG. 3. Y+B+R accented by one of these V or O or G, 4. YG+BV+RO accented by one of these RV or YO or BG. Five and six color combinations will probably not be used very often on a temari ball, but here are some options. For a 5-colored temari try using any 5 side by side colors. For a 6 color combination try using 5 side by side colors and the complement of the middle color of these 5 or pick 3 side by side colors and their complements or pick every other color around the wheel.